If you are looking for an easy variety, Fritillaria Acmopetala is a great introduction to this fascinating genus. Readily available for sale online, these are a plant and forget bulb. 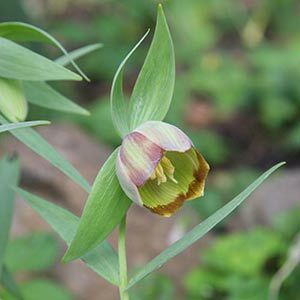 With its attractive pendulous bell shaped flowers Fritillaria Acmopetala which emerge a subtle olive green and brown tinged in late spring these bulbs are originally from Turkey and surrounding areas and do require a dry dormancy like other Fritilaria bulbs. Usually available for sale in Australia from February through to April, they are best planted immediately. Bulbs are usually sold in late summer ready for planting. For impact, plant Fritillaria Acmopetala bulbs in groups of 8 – 10 in part shade to full sun in a well drained position. Fritillaria Acmopetala bulbs do well in the rock garden or a well drained pot. A fertile soil is required so if growing in containers remember to repot every three years as the potting mix becomes exhausted. Flower colour – Olive green with red tones.